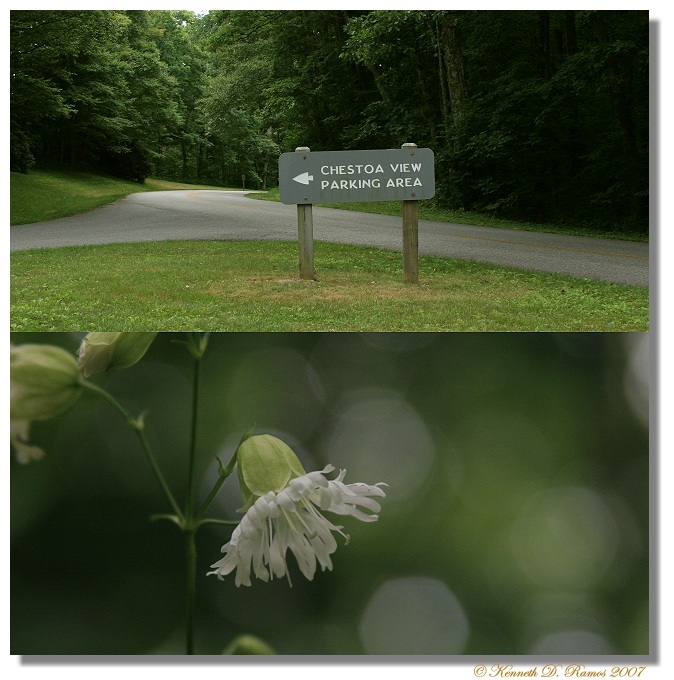 Chestoa is located on the Blue Ridge Parkway, near the community of Linville Falls (BRP mile post 390, elev. 4090 feet). Chestoa though very beautiful and really seldom visited, has a dark history however. Back many years ago, sometime in the 1960's if I am not mistaken, two women were thrown to their deaths from the overlook, some one thousand or more feet above the valley of North Cove. Though in these images you may see that there are plenty of trees that could possibly break ones fall, looks here can be quite decieving. They fell all the way to the bottom of the mountain. Many years later, the remains of a third were found, if that person was associated with the other two, I don't know. Now that the dirty laundry has been aired...welcome to beautiful Chestoa View. As one enters Chestoa View, they will find numerous wildflowers, a couple of picnic areas, and a spaceous parking area. Clean and quiet, not hampered by the maddening crowds as some of the other places along the parkway, Chestoa is a place to spend a pleasurable afternoon or to have a picnic with the family. Though the area is and can be dangerous, there are safety barriers in place around most of the area but small children and adults unfamilar with being out of doors in places like this...you may want to keep a sharp eye out for them. 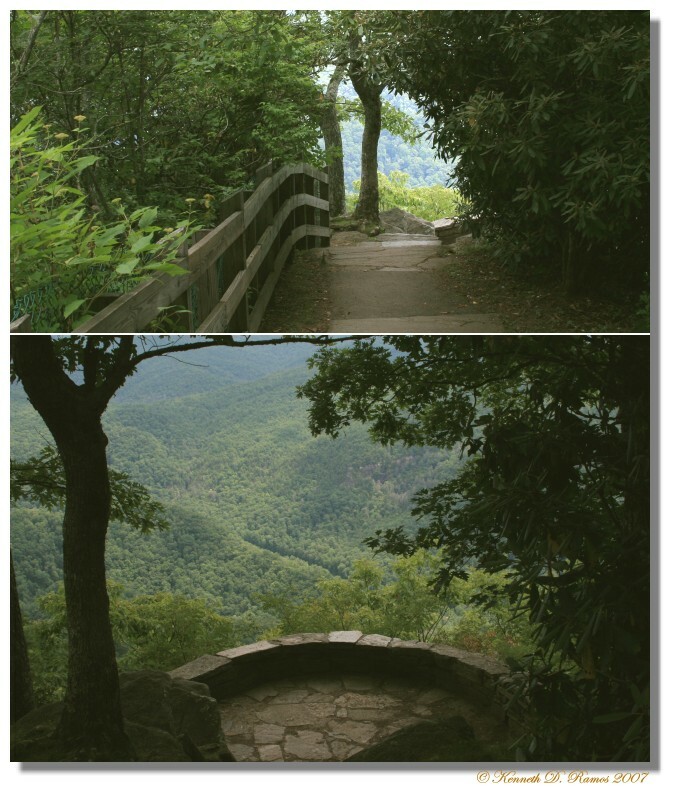 There is a stone walkway down to the overlook and as you can see in the photographs there are wood fences reenforced with plastic coated chain linking. This is to keep small children and pets from accidentally going over the edge of Chestoa. The overlook itself is also stone paved and there is a small safety barrier here at the edge. It is important here also that you keep small children or pets in hand or teathered in someway. That little rock barrier is only a couple of feet high. One would think that the park service would put a chain link barrier of three or four feet around it too but then that would spoil the view. Plenty of chances and subjects here for photography of all sorts. 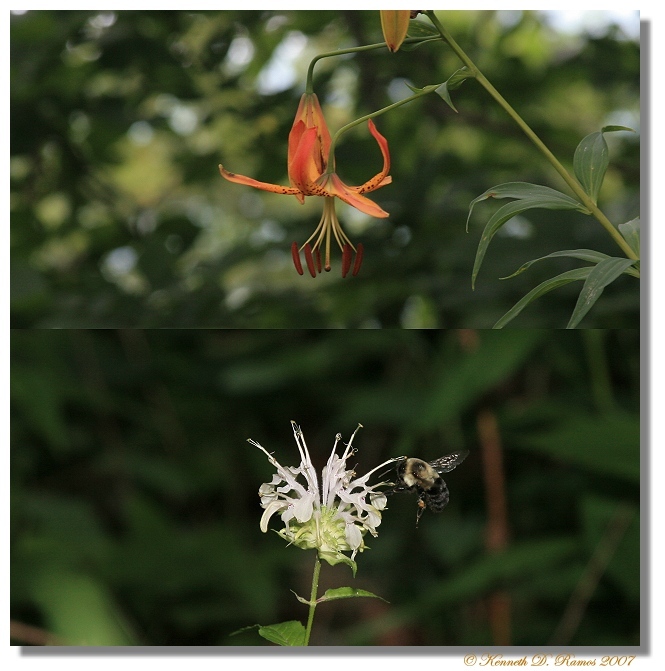 The area of the mountain is alive with all sorts of insects and wildflowers, including some varieties of fungi and of course there are Myxomycetes for us Myxo lovers, though I did not take the time to look for them. 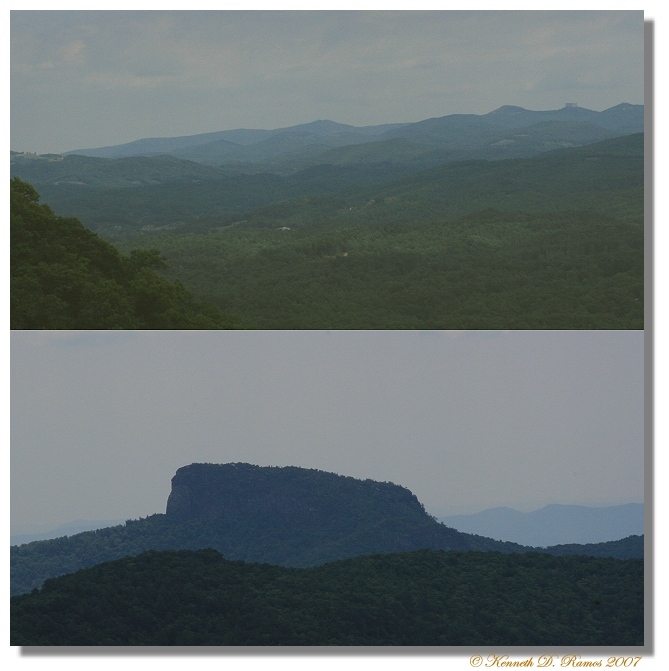 There is also a .6 mile hiking loop which takes one along the edge of the mountain drop off to two other scenic areas, these areas have rather large, open, and rail type wooden fences, though there is no chain linking around them and you walk along the very edge of the rock cliffs. Here once more keep children and pets under control. It is a very long way to the bottom of the mountain. Though at the bottom is Hwy 221, so the EMT's will have no problem getting to picking up what is left of you! The hiking loop is quite easy for anyone in reasonable health and should not be passed over if one happens to visit this area. It is quite safe if you are careful and watch where you are going though. If it wasn't the park service would not allow anyone around the area or make it accessable. Maybe on my next visit there, I will take some photographs of that area too. That is some drop off that overlook!!!! I googled "Chestoa murder" and found some odd stuff. Apparently a fellow was accused of murdering his wife and her friend there, then going over the edge himself in a non-fatal way to camoflage that he did it....Not clear to me what happened exactly, though.